In January 2013, the Center for Sharing Public Health Services announced grants totaling nearly $2 million to 16 teams of health departments across the United States. The teams explored how cross-jurisdictional sharing (CJS) might help them to fulfill their mission of protecting and promoting the health of the communities they serve. Funding for the demonstration sites ended in early 2015. Select one of the sites below for more information. This project team plans to develop a sustainable cross jurisdictional sharing (CJS) model for public health service delivery among the city health department, the county within which the city is located, and the state public health agency. The team will determine where service gaps exist, analyze options for addressing those gaps, and develop a plan for how CJS could reduce those gaps. The $124,826 grant supports this examination of CJS involving one state and one city health department serving more than 280,000 people in one county and the city. Building on prior work, the project team will develop a cross jurisdictional sharing (CJS) transition plan for the integration of three separate health departments. The transition plan will include an implementation timeline; description of proposed financial, organizational and governance structures; performance management system measures for possible sharing agreements; and a quality improvement plan. Additionally, the project will complete a five county community health assessment and produce a training module about its overall process for others interested in pursuing a similar effort. The $124,787 grant supports further CJS action planning involving two single county health departments and one multi-county health department serving more than 66,000 people across five counties. 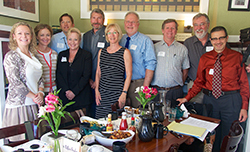 Members of the Central Oregon team and site visitors, from left to right: Tammy Baney, Kelley Evans (visitor), Tom Kuhn, Muriel DeLaVergne-Brown, Ken Fahlgren, Mary Goodwin, Pat Libbey, Mike Ahern, Tom Machala, Gianfranco Pezzino. Oregon’s Crook, Deschutes and Jefferson Counties plan to improve their collective effectiveness, efficiency and expand their capacity in the area of public health preparedness through the use of a cross jurisdictional sharing (CJS) approach. The project team will develop a multi-county approach to managing Medical Reserve Corps volunteers, preparing a regional risk communication plan, and developing multi-county approaches to preparedness planning, training and exercising. The $65,006 grant supports exploration and development of CJS approaches to improve public health preparedness among three single county health departments serving more than 200,000 people across three counties. Title: Employing a shared approach to improving public health dental services in Cabarrus and Guilford Counties, North Carolina. The Cabarrus Health Alliance will partner with Guilford County Health Department to develop a plan to restructure their dental programs into a shared services model, which will include assessing the two counties’ dental needs and potentially sharing staff and other resources. Project work also includes preparing an action plan for implementation of the recommended model for sharing. The $124,708 grant supports the planning and implementation of a CJS approach to dental service delivery between a single county health department and a single county health alliance serving more than 670,000 people in two non-contiguous counties. The Carson City Health and Human Services, a neighboring county (where public health services are provided by the state) and the Nevada State Health Division will be developing a cross jurisdictional sharing (CJS) model and plan to improve public health service efficiency and effectiveness within the local jurisdictions. The project team will develop a cross jurisdictional sharing model and toolkit for implementation of the model to be shared with participating and neighboring jurisdiction. The team will also prepare a detailed implementation plan for a CJS approach to delivering environmental health services at the local level. The $124,688 grant supports CJS exploration and planning involving the state health division and one city health department in order to serve more than 100,000 people in one city and a neighboring county. 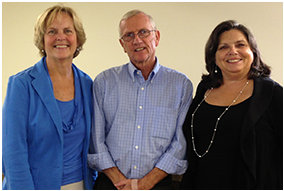 The Central Massachusetts Regional Public Health Alliance (CMRPHA) and its six participating local jurisdictions will further develop the capacity and capabilities of the newly formed multi-jurisdiction district to perform effectively and efficiently with a goal of accreditation by 2015. Cross jurisdictional sharing (CJS) project work includes analysis and planning needed to ensure longer term financial stability and development of common policies, procedures, practices and workforce development throughout all the jurisdictions in the district. The $124,242 grant supports these CJS improvement efforts by the multi-jurisdictional health public health alliance serving nearly 280,000 people in one city and five towns. Building on their cross-jurisdictional sharing (CJS) efforts to date, Cowlitz, Clark, Skamania and Wahkiakum County Health Departments and the Cowlitz Tribal Health Department will develop a preferred CJS model, identify services that have the potential to be shared effectively, and prepare a workplan for implementing the selected model. The $115,168 grant supports continuing CJS development and improvement efforts involving four single county health departments and one non-reservation based Tribe serving more than 1.1 million people across four counties. The project team will explore cross-jurisdictional sharing (CJS) across a 25-county rural region served by six local health departments. Project work includes preparing inventories of current capacity in each of the departments along with an inventory of current CJS arrangements, analyzing different CJS models and identifying those seen as most feasible for the region, developing a CJS strategic plan—including goals for each department as well as identification of common goals across the region—and preparing a feasibility study examining potential for multi-jurisdictional accreditation. The $125,000 grant supports the exploration of CJS options involving five multi-county and one single county public health agencies serving more than 650,000 people across 25 counties. 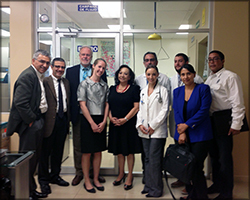 Site visit participants tour a tuberculosis lab in Tijuana. Pictured from left to right are: Richard Kiy, Gianfranco Pezzino, Pat Libbey, Katie Wehr, Julia Estrada, Rafael Laniado, Viridiana de la Herran, Isaac Laniado de la Mora, Sonia Contreras and Héctor Perez. In order to more effectively respond to cross border tuberculosis cases, the project team plans to use a cross jurisdictional sharing (CJS) approach to formalize and improve the participating jurisdictions’ current working arrangements. The team will assess current working arrangements, explore options, and draft proposed CJS approaches with attention to financial, legal and policy related issues with the intent of ensuring the long-term sustainability of vital cross-border TB care and prevention services. The $125,000 grant supports the examination of CJS for coordinating service delivery involving two county health departments, one state health agency, and the state of Baja California in Mexico serving nearly 6.4 million people across two counties and the Baja California border region. Photo by Kent State University. A recent Task Force report called for Portage County Health District and the Ravenna and Kent city health departments to consider entering into a cross jurisdictional sharing (CJS) arrangement for the delivery of public health services across the jurisdictions. A project team led by Kent State University Foundation will work with the Task Force to inventory and evaluate current CJS arrangements, analyze CJS models for their potential use, and develop a strategic action plan for implementing the preferred CJS model. The $125,000 grant supports the analysis and development of a CJS model among two city health departments and one county health district serving more than 160,000 people in one county and two cities. Horseshoe Lake in Genesee County. Sunrise: Two Worlds Coming Together in Western New York. Title: Pursuing integration of public health services and exploring accreditation options in Genesee and Orleans Counties, New York. Two New York county health departments, Genesee and Orleans, will develop a cross-jurisdictional sharing (CJS) implementation plan for a shared senior leadership approach, including the director and other key positions, serving both departments concurrently. Additionally the project team will explore and make recommendations about other CJS opportunities between the two departments. The $124,787 grant supports this CJS plan development and exploration involving two county health departments serving more than 100,000 people across two neighboring counties. The Minnesota Department of Health (MDH), using several pilot sites throughout the state, plans to explore options for implementing a statewide approach to cross-jurisdictional sharing (CJS) and identify ways to assist local health departments with CJS throughout the state. MDH goals include sharing staff and data systems, improving IT and standardizing environmental health inspections. 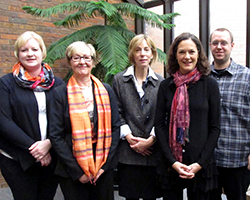 The $124,953 grant supports exploration of CJS options involving seven multi-county Community Health Boards, five single county Community health boards, three single city Community Health Boards and the State Department of Health serving nearly 1.2 million people in 27 counties and three cities in different areas of the state. RiverStone Health Department will examine how cross jurisdictional sharing (CJS) could be structured and used to improve the efficiency and effectiveness of public health services by sharing resources, expertise, policy development and infrastructure between a more urban health department and a neighboring rural department. The project will analyze different CJS models with focus on those involving departments of differing size and identify components best fitted to their needs. The project will also analyze legal and policy issues that would need to be addressed in the preferred CJS model and finally develop a CJS implementation plan. The $125,000 grant supports CJS exploration and implementation planning involving one county and one city-county health departments serving more than 160,000 people across two neighboring counties. 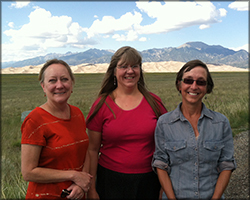 Members of the San Luis Valley team, from left to right: Kathleen Matthews, Kimberly Bryant and Della Vieira. Six rural county health departments in Colorado’s San Luis Valley region will explore the feasibility and desirability of engaging in cross jurisdictional sharing (CJS) arrangements to improve public health service delivery throughout the region. Building on recent inventory work, the project team will prepare a detailed capacity and current shared service assessment. The team will conduct a feasibility study examining CJS options, paying particular attention to issues of financing, governance, legal and policy issues of import. This work will be followed by the development of a strategic plan for CJS implementation among the participants. The $124,980 grant supports this CJS exploration and planning involving six county health departments and the state health department serving nearly 47,000 people across six counties. One urban county, seven rural counties (where public health services are provided by the state) and the Nevada State Health Division plan to determine whether a local cross-jurisdictional sharing approach (CJS) can be developed and implemented to improve the efficiency and effectiveness of public health service delivery. The project team will prepare a baseline report describing both region and jurisdiction specific current services and needs, public health funding and infrastructure capacity and stakeholder perceptions. The team will then assess CJS model options and make recommendations for preferred alternatives along with an implementation strategy and sustainable funding approach. The $125,000 grant supports the exploration and model development of a CJS approach involving the state health division and a county health department in order to serve more than 540,000 people across eight counties. More than 100 people gathered in Kansas City March 12-14, 2013 for the first Shared Services Learning Community (SSLC) meeting. The SSLC is made up of 16 sites across the United States that are exploring, expanding or implementing ways to share services to increase the efficiency and effectiveness of delivering public health services. Public health officials and policymakers spent the conference becoming acquainted with the variety of nationwide projects, meeting colleagues and sharing ideas on how best to move their projects forward. The Wednesday morning session began with welcoming remarks by Grace Gorenflo, Senior Project Consultant for the Center for Sharing Public Health Services. She was followed by Katie Wehr, Project Director at the Robert Wood Johnson Foundation, the Center’s funder. Then, Center Co-directors Patrick Libbey and Gianfranco Pezzino offered opening comments. 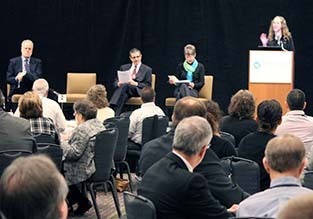 The morning was highlighted by two nationally-recognized keynote speakers. Ron Carlee, International City/County Management Association (ICMA), spoke on the topic of Creating and Sharing Knowledge: Getting the Most from the SSLC. Carlee said that a vibrant and synergistic learning community is built on its members’ active commitment to sharing knowledge, experiences and perspectives across different organizations and sectors. He urged conference participants to focus on how individual members can most effectively contribute. See a video of his presentation. A large portion of the conference involved hearing from site participants. Site team leaders participated in a variety of panel discussions on topics from Setting the Stage and Managing the Effort to What the SSLC Experience Tells Us. At the end of the conference, many participants said the event gave their teams a chance to rethink and redefine their goals. Site team leaders participated in video interviews at the conference which captured a synopsis of each project, what each team hopes to accomplish and where each team anticipates challenges. You can view those individual interviews and learn more about the individual site projects by visiting the Funded Sites tab at PHSharing.org. The Center for Sharing Public Health Services has produced three brief videos to help members of the Shared Services Learning Community participate in meetings via Adobe Connect. To play the videos, select the arrow in the lower left corner of each video. To make the video larger, select the full screen icon, which is located near the lower right corner, right next to the word Vimeo. For more videos from the Center for Sharing Public Health Services, visit our Vimeo page. Ron Carlee, International City/County Management Association (ICMA), gave this presentation at the first Shared Services Learning Community meeting in Kansas City on March 12-14, 2013. In the presentation, “Creating and Sharing Knowledge: Getting the Most from the SSLC,” Carlee said that a vibrant and synergistic learning community is built on its members’ active commitment to sharing knowledge, experiences and perspectives across different organizations and sectors. He urged conference participants to focus on how individual members can most effectively contribute. Justeen Hyde, Institute for Community Health, gave this presentation at the first Shared Services Learning Community (SSLC) meeting in Kansas City on March 12-14, 2013. In the presentation, “Factors for Success: What the Literature Tells Us,” Hyde said that the existing evidence base can inform strategies and decisions regarding activities to explore, implement and/or improve CJS arrangements. Her speech reviewed research findings that describe factors attributed by policymakers and public health officials to successful CJS efforts. Cross-jurisdictional sharing (CJS) is simple in its concept – sharing services across jurisdictional lines. However, it’s complex in its implementation. Search our Resources to identify best practices, lessons learned and tools that focus on how to explore, prepare and plan, and implement and improve CJS arrangements. The list below each category name is just a subset of what is available. To see the entire list for a category, select the category name. This webinar examines ways to enhance communications and partnerships between policymakers and public health officials and managers. Watch a video of the webinar below. The Center for Sharing Public Health Services is committed to doing what we can to facilitate the exploration, planning, preparation, implementation, monitoring and improvement of CJS approaches. For this reason, we provide technical assistance to jurisdictions considering or adopting cross-jurisdictional sharing (CJS) approaches. Email conversations: Many technical assistance requests can be handled over email. For example, we can use email to answer straight-forward questions and to point out existing resources that can help with specific issues. Phone consultations: More complex issues may require a phone call or two. We can offer advice or discuss complicated issues over the phone. Virtual presentations: We can meet via conference call with your staff or stakeholders, and we can provide educational webinars for your group. On-site meetings: In a limited number of cases, we may be able to travel to your location to give an educational session, provide a workshop or facilitate a discussion with multiple stakeholders on CJS. Fill out our technical assistance request form. Call us toll-free at 1-855-476-3671. For general information on how to use this search feature, visit our CJS Resource Library page. For more information about the filters below, click on the information icon to the left of each filter's name. To expand a filter, select the arrow to the right of each filter's name. To search the entire site, don't check a filter. Since the most useful items are generally found in the Center's CJS Resource Library, selecting that filter will usually yield the most useful results. Select several topics to narrow your search. Currently, only items in the Center's CJS Resource Library are assigned a topic. Therefore, selecting a topic will limit your search to the CJS Resource Library. The Center's Roadmap guides jurisdictions through the process of considering or establishing CJS arrangements. Selecting one or more Roadmap Phase(s) will limit your search to items in the CJS Resource Library that are helpful during those phases. All items in the Center's CJS Resource Library are classified with one Resource Type. Since they are mutually exclusive, you will need to unselect one Resource Type to select another. To learn more about Resource Types, visit our CJS Resource Library page. All items in the Center's CJS Resource Library are classified with one Resource Origin. Since they are mutually exclusive, you will need to unselect one to order to select another. Items marked as "Public Health CJS Initiative," were provided by the Center's grantees and are usually documents they used in their CJS arrangements.